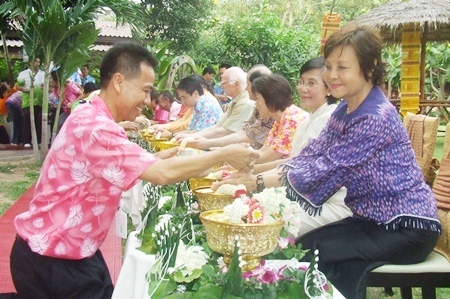 Local political and community leaders were on hand as the Diana Group celebrated Songkran with a traditional water-blessing ceremony. Diana Group Managing Director Sopin Thappajug led the April 14 ceremony at the Diana Garden Resort, attended by Pattaya City Council Tourism and Sports Committee Chairman Rattanachai Sutidechanai, Tourism Authority of Thailand Pattaya Director Niti Kongkrut and Human Help Network Thailand Director Radchada Chomjinda. Khomsan Seesam (left) leads staff of the Diana Group to perform the rod nam dam hua ceremony to show their respects to Sophin Thappajug and other elders of the community.